Special to the Pahrump Valley Times Pahrump fire crews were dispatched for a mutual aid assignment to Southern Inyo County in Shoshone for a semi truck fire just after 2:30 p.m. on Thursday April 4. Pahrump Fire Chief Scott Lewis said the Southern Inyo Sheriff’s Office halted traffic in all directions coming into the Town of Shoshone. Lewis noted that the initial investigation revealed a non-specified liquid hazardous material aboard the semi. No injuries were reported. 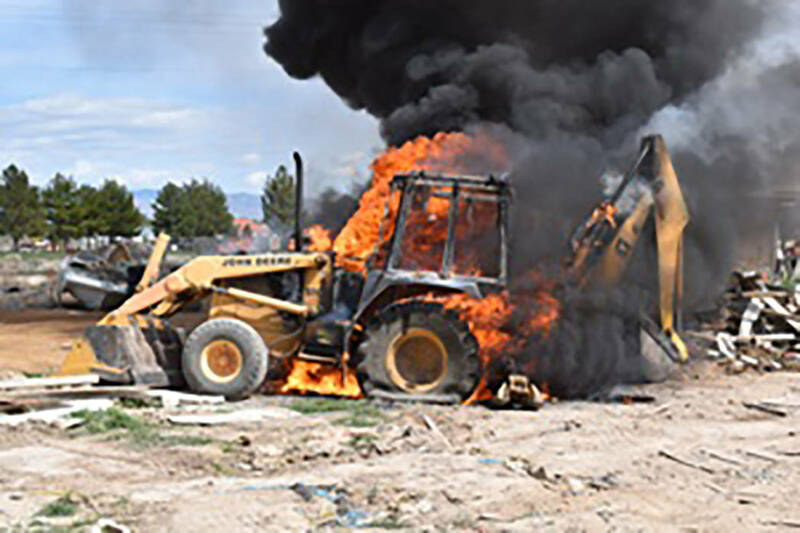 Special to the Pahrump Valley Times No injuries were reported as a result of a backhoe fire as Pahrump fire crews were dispatched to the area of East Heritage Street on Wednesday April 3. Fire Chief Scott Lewis said the cause of the fire appeared to be accidental in nature, possibly related to a mechanical failure of the backhoe’s hydraulic system. Special to the Pahrump Valley Times A motorcyclist was transported to UMC Trauma in Las Vegas following a collision at the intersection of North Leslie Street and Gally Road on Sunday afternoon April 7. a landing zone was established on scene for Mercy Air-24, where Patient care was transferred. The medical condition of the rider was not disclosed. Pahrump Valley Fire and Rescue Services Chief Scott Lewis said the incident occurred on Tuesday, April 2, just before 2 p.m.
Fire crews extinguished the fire in short order. Lewis said the cause of the fire stemmed from an accidental ignition source while the owner was making repairs to the vehicle. On Wednesday, April 3, at approximately 2:22 p.m., fire crews were dispatched to the area of East Heritage Street for a fire involving a backhoe. While responding, crews were receiving numerous reports of the fire, and the possibility of it spreading to nearby debris piles and a structure. Crews managed to protect the structure, where the fire was quickly controlled with no further extension. 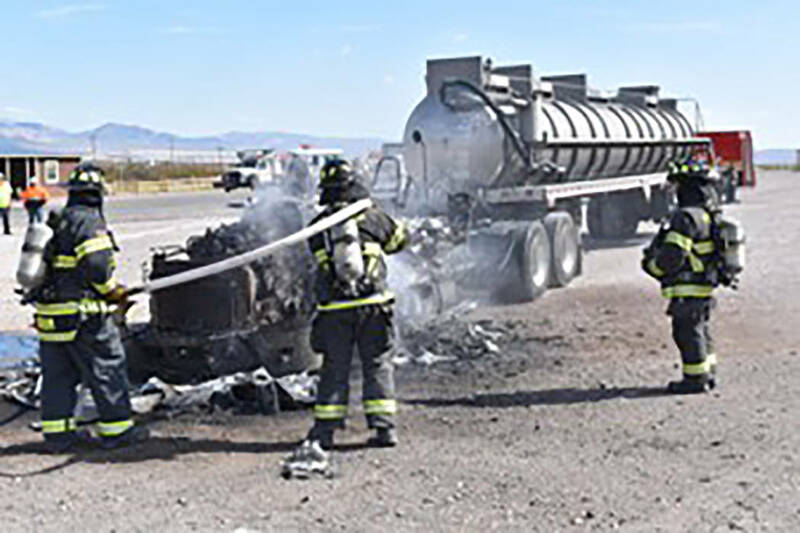 On Thursday, April 4, at approximately 2:39 p.m., crews were dispatched for a mutual aid assignment to southern Inyo County, for a semi-truck fire. Lewis noted that the initial investigation revealed a non-specified liquid hazardous material aboard the semi. Lewis went on to say that the Southern Inyo Sheriff’s Office halted traffic in all directions coming into the town of Shoshone. Jolene Young and her husband were actually traveling into Pahrump when they saw heavy smoke billowing from the cab of the vehicle. After the couple parked their car near a convenience store, they learned that the town was under a mandatory evacuation. “The Inyo County officials really weren’t saying very much about the situation,” Young said. “We live in Death Valley, and we were trying to go to Pahrump, but we didn’t want to have to go all the way back to the junction, so we figured we would just wait it out. They ended up coming over to our vehicle and told us that everybody had to leave. 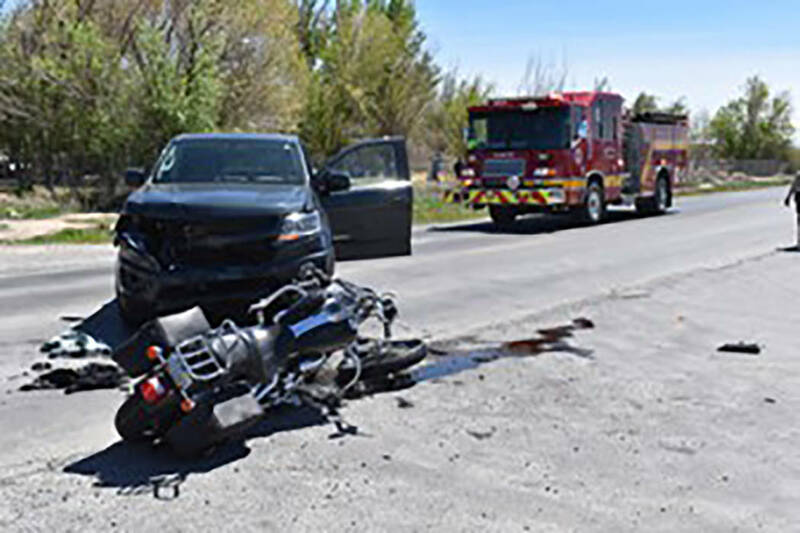 On Sunday afternoon, April 7, Pahrump fire crews were dispatched for a report of a motor vehicle accident at North Leslie Street and Gally Road, involving a motorcyclist.